I totally DO NOT recommend using the Blink Glitter liners AT ALL because 1, they do not go on evenly and 2, those glitter chunks DO FALL OUT!! That's definitely something you don't want anywhere near your eyes!! These liners go for RM13.90 each! The Precision Liquid liner however, is AMAZING!! The felt tip offers maximum control, and the black is about as black as a black can get (lol!!)! :D I'm hoping that they release more colors (or at least, a brown!!)! :D This liner sells for RM16.90 each. 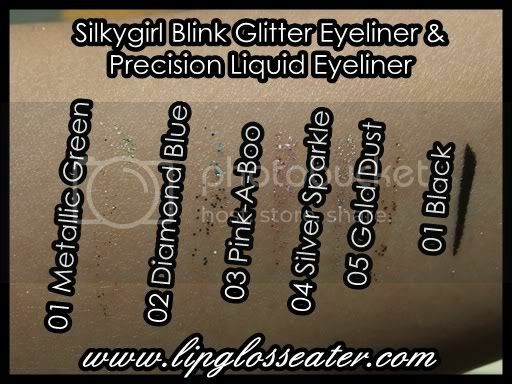 I'm not a fan of glitter eyeliners and these look horrible! Thanks for the swatches.